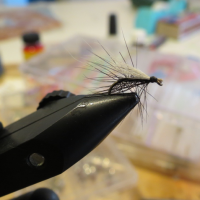 The old classical trout flies were tied like salmon flies, with a wing and throat hackle, plus a tail, for instance Watson’s Fancy, Peter Ross and Teal and Black. No one knows for certain why the salmon takes a fly (they are not feeding), but we can be sure that the trout are feeding. 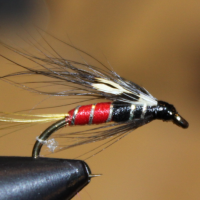 These flies were tied in certain proportions (classical salmon flies too). The wing should extend to the bend (yellow). 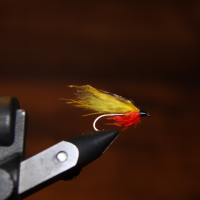 The throat hackle should extend to the point of the hook (red). 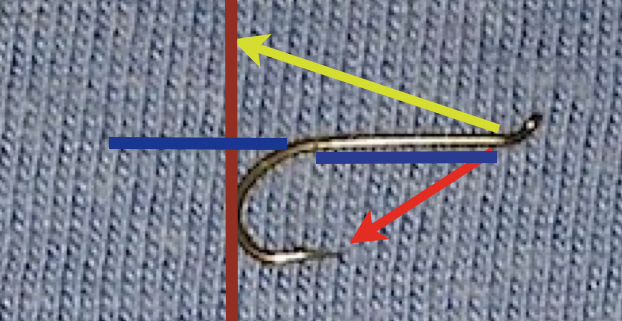 The tail should be as long as the shank (blue). 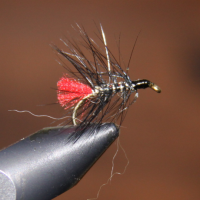 Flies in those proportions are very pleasant to look at, and the eyes approve instinctively. It so happens that the fish seem to agree, at least some of the time. Whether I find them beautiful because they fish, or they fish because they are beautiful, I do not know, but it is probably being researched somewhere. 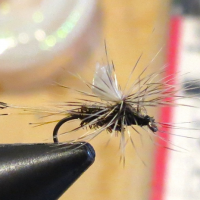 This type of fly does not look like anything in nature but catches all the same. Then there are the imitators. 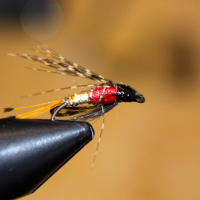 Most dry flies are imitating flies hatching in the surface film. 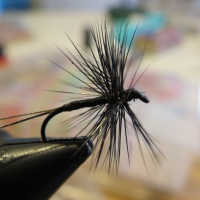 They are very pretty and look “natural”, and are tied on small hooks down to #28. Some are incredibly realistic. 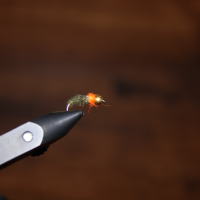 I do not find that it is essential to use super realistic flies. 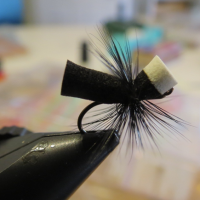 If the shape, silhouette and color is right, I am happy because the trout approve. 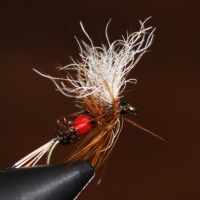 Then there flies that imitate insects in various stages of development or pupae and larvae. We even have imitations of water snails. 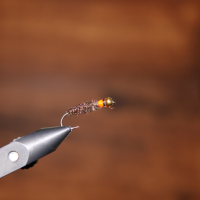 This type of fly is often weighted with a brass bead that we thread onto the hook and place behind the eye. 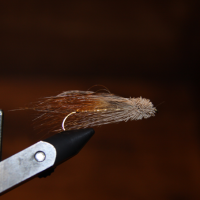 If we tie in hackle or “legs” they extend to the point of the hook. Sometimes there is a tail sometimes not. 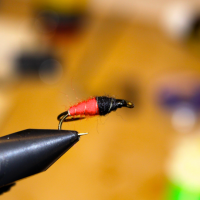 Sometimes we use a long shank hook for bigger insects. 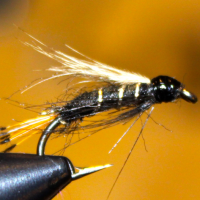 Sometimes we tie in a so-called thorax in the anterior part of the fly. 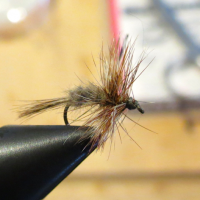 Next stop are the streamers. We tie them on hooks #2-6. 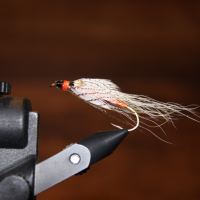 The idea is to imitate a small baitfish that subsequently is eaten by larger fish. 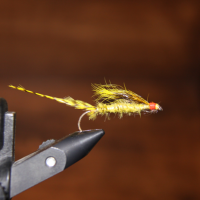 We like to say ”big fly – big fish” and that is certainly true. 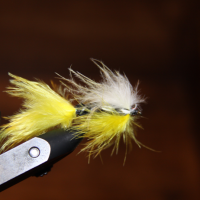 The streamers can be weighted with lead tied to the shank. 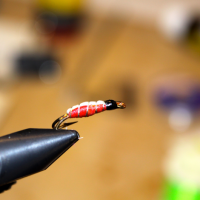 Another way is to use a piece of a sink chain, where we place 2 beads with the connecting pin transversely, across the shank behind the eye. 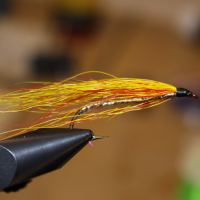 The streamers are very versatile flies taken by many fresh water fish, and they are also extensively used in the salt.